Frank Broyles’ achievements with Razorback athletics are known across Arkansas and beyond. His accomplishments on behalf of University of Arkansas academics are not as well known as the 55 years he served as coach and athletic director, but they clearly demonstrate his pride in the U of A.
Broyles died Monday at his home in Fayetteville. He was 92. Chancellor emeritus Dan Ferritor, a faculty member when the campaign started, credits Broyles with the success of the $2 million fundraiser. It was a powerful message, and when Ferritor was named chancellor in 1985 he turned to Broyles again in a campaign to save Old Main. At that time the signature building on campus had been closed and fenced off for almost 5 years, with little chance for state funds to renovate the building. Broyles agreed to open doors, introducing the new chancellor to friends and supporters. Broyles showed his support in a less public way as well. When John A. White was named chancellor in 1997 he, too, found solid support from Broyles. It helped that White had come from Georgia Tech, Broyles’ alma mater. “He said he wanted the University of Arkansas to enjoy the same level of respect in academics as Georgia Tech, enjoyed,” White recalls. Toward that end, Broyles introduced White to people around the state who had supported the athletics program. Dave Gearhart was back at the U of A by this time, once again as vice chancellor for University Advancement, leading the new ambitious new campaign. Frank Broyles was one of the first people he turned to. “We asked Coach Broyles to serve as one of the chairmen of the campaign, which ended up raising over $1 billion. This would not have happened without his extraordinary leadership,” Gearhart said. As co-chair of the University’s Campaign for the Twenty-First Century, Broyles particularly helped with fundraising efforts for the Pat Walker Health Center and the Razorback Marching Band. 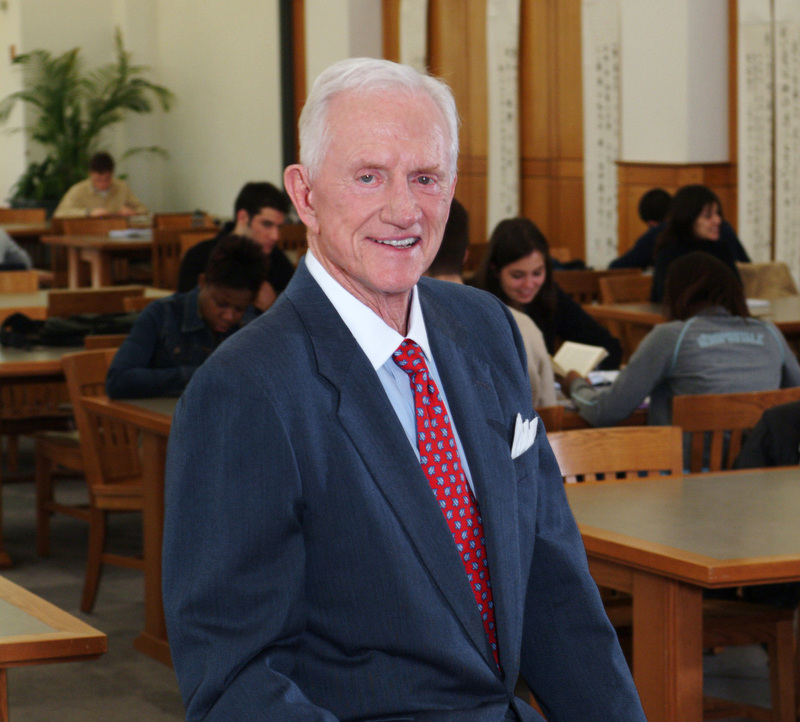 Broyles contributed more than his time and effort to the academic side of the University of Arkansas: In 2001, he made a gift of $200,000 to University Libraries for an endowment to supplement collections and purchase library equipment such as digital scanners and microfiche reader printers.